I recently found an old VGA monitor on the side of the road and it inspired me to see if I could get my Mojo FPGA board to output a VGA signal. 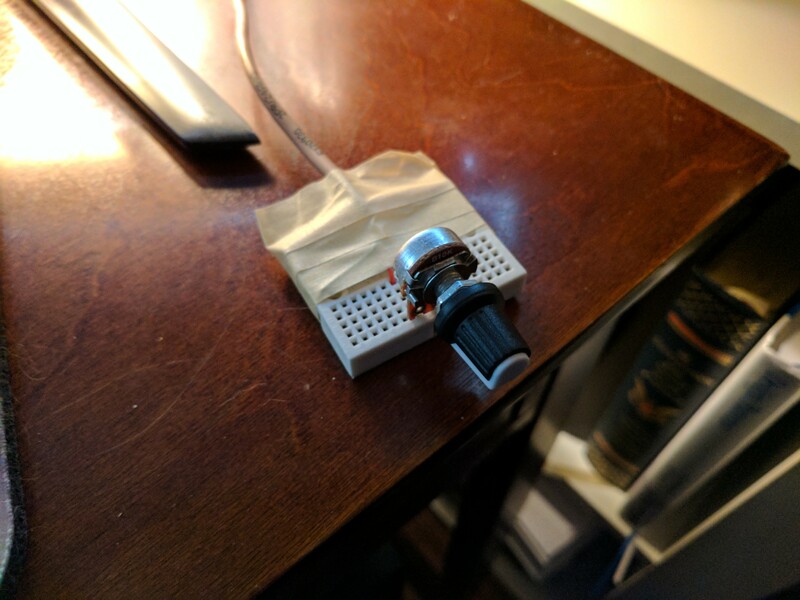 I took the monitor apart and wired its VGA cable directly to my Mojo. I read up on the VGA specification and learned that getting it to work was as easy as adding resistors to the Red, Green, and Blue outputs. I decided to try my hand at implementing the PONG game that is outlined on fpga4fun.com. 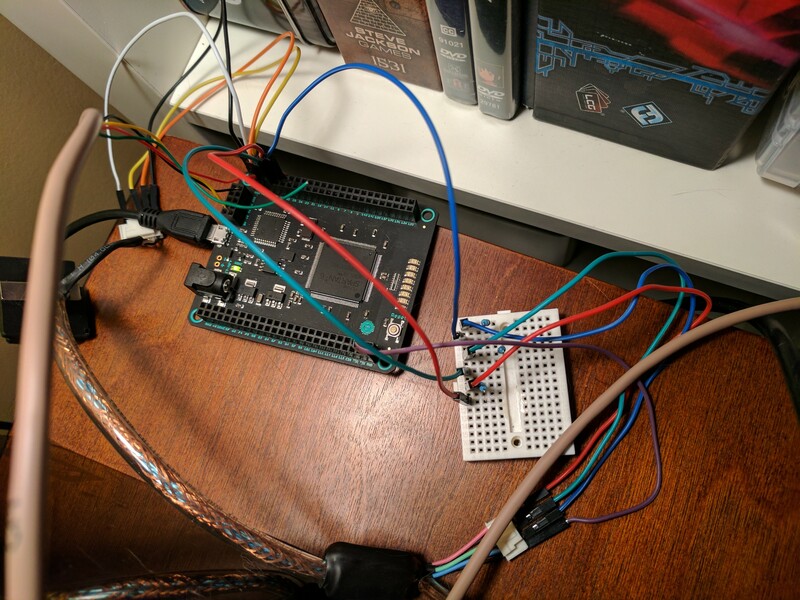 There were some differences between that FPGA that they were using and my Mojo board, so I had to go through some trial-and-error. For instance, the Verilog code that they have on the site depends on a 25MHz clock and my Mojo uses a 50MHz clock. I tried various ways of dividing the clock without success. I finally found a great example using a 50MHz clock, but it wasn't quite right because it used 8-bits to encode the RGB values, 3 bits for red and green, and 2 bits for blue. I couldn't get this to work, so I found the code that it was based on and found 1 bit per color implementation. I was finally able to get a signal. The rest of the time was spent implementing the Pong code from the original article. However, the article used a mouse input. I wanted to use a regular potentiometer (dial) to make it more like the "good old days". So, I wired up a pot to the Mojo and altered the Verilog to use it. Honestly, my code turned out to be spaghetti code because I haven't quite learned how to modularize Verilog to my satisfaction. I was able to get the paddle working and responding to movement of the potentiometer, but for some reason, the code for the ball just didn't work in my implementation. I'm guessing it has to do with the timing. I still haven't been able to get the ball working, but I was pretty happy that the paddle works. The Mojo wired to the VGA cable and the paddle "controller"
I'd really like to get the ball working with this. My scoring will be different than traditional Pong as I am not yet ready to tackle the "AI" of the computer player. I'd like the player to score 1 point each time the ball hits the paddle and lose a point each time the ball hits the bottom wall. If the ball hits the bottom wall while the score is 0, then the game is over. I'll have to add in a reset button, but that shouldn't be much trouble. I just found another implementation of Pong in VHDL that I may try later. It divides the 50MHz clock into a 25MHz clock using a mod 2 counter. I discuss my implementation of that code in another post. I haven't written any VHDL, yet, so I'm still trying to wrap my head around it. It was hard enough switching from Mojo's Lucid language to Verilog as Lucid made things a bit easier. However, I felt that since there were a lot more people out there using Verilog that I would be better off learning that. Now I'm learning that there are even more people using VHDL.